Hurray! Me-Made-June 2011 is over and I can stop taking outfit shots every day. I enjoyed the challenge but not the constant photo-taking! Day 22 – Colette Sorbetto top in blue floral print. Even though I made a muslin for the Sorbetto top and adjusted the fit, I think I still need to work on getting it right. This top is nice but I think it’s still a little too big. I’m wearing it with one of my favourite skirts from Warehouse which inspired me to buy the Sewaholic Crescent skirt pattern as I thought the shape was similar. I decided to try and get more interesting backgrounds for my photos. Can you see Little Tweedie’s head at the bottom?! One more thing to say about this – I got the fabric in a bundle from a charity shop. I got four different fabrics, each 1.5m, for £1. You can’t complain when your main fabric cost 25p! Day 23 – No outfit shot today as I was in hospital for minor surgery – nothing serious and it all went fine. Day 24 – New Look 6026 top, worn with a ‘re-fashioned’ cord skirt – ‘re-fashione’d meaning I chopped about 8 inches off the length and rehemmed it. Unfortunately you can’t see any evidence of this on the photo, which would not have been the case if my camera had not broken directly after taking this shot! This is another attempt at a more interesting background. 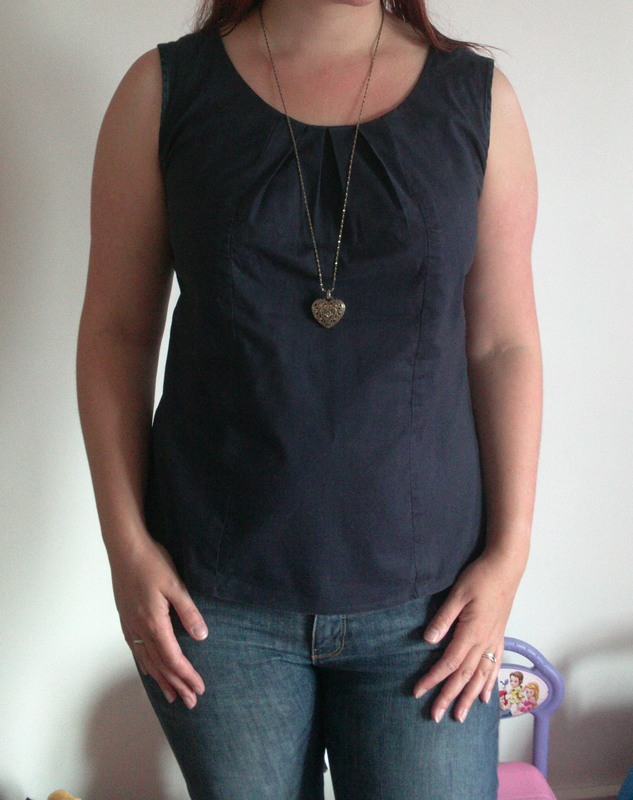 Day 25 – Simplicity K2938 navy top, worn with jeans. There’s not much else to say about that really. 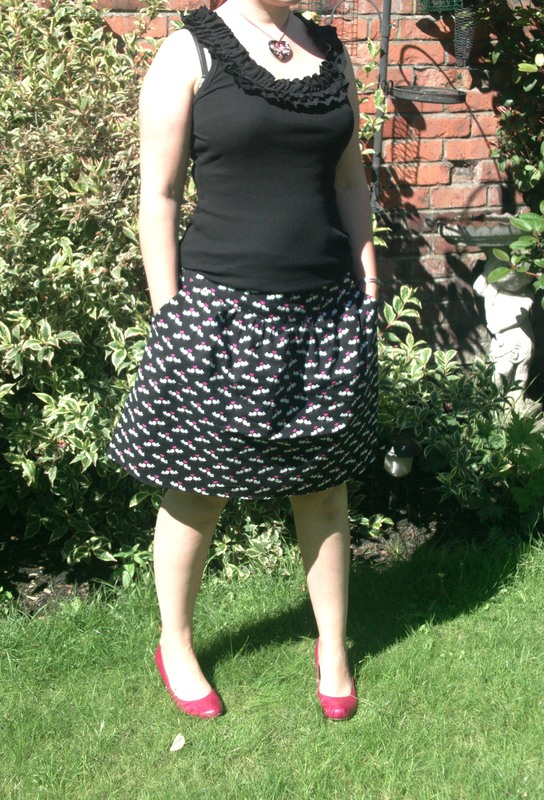 Day 26 – Sewaholic Crescent skirt with Michael Miller Lovebirds fabric. I wore the exact same outfit on Day 18 but with a different necklace! Day 27 – New Look 6789 in green and purple floral print. 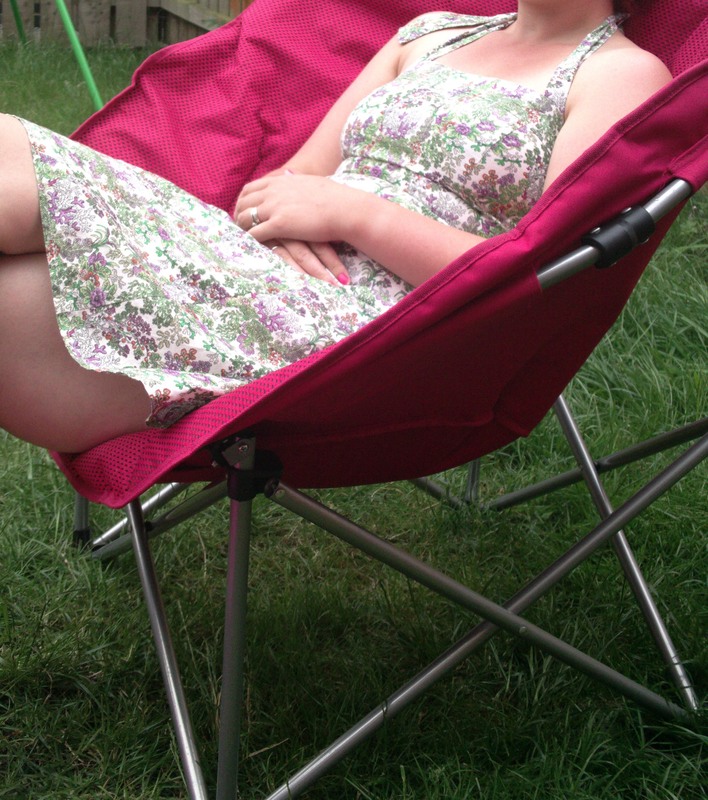 This is my go-to dress on a hot sunny day as it’s a really light and floaty halter-neck. 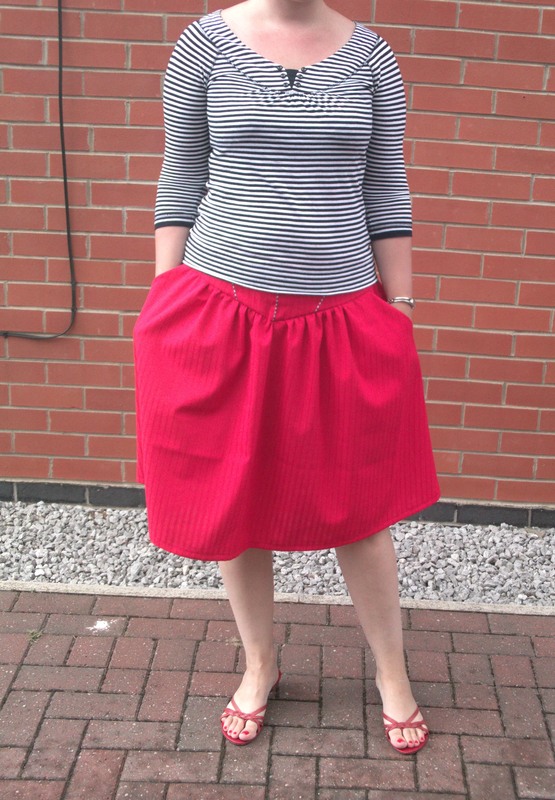 Day 28 – Self-drafted nautical star skirt, this time with a red tshirt and red Irregular Choice shoes. Back to the boring backgrounds I’m afraid. 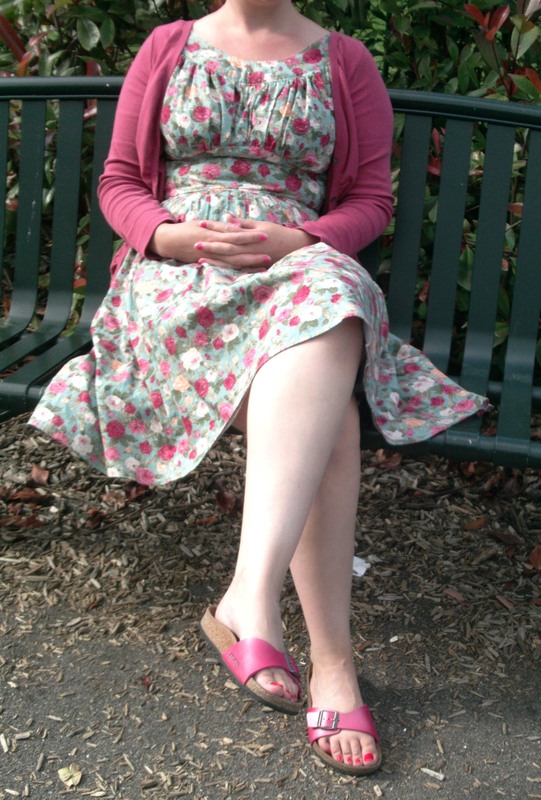 Day 29 – Colette Chantilly dress with pink cardi and pink Birkenstocks. 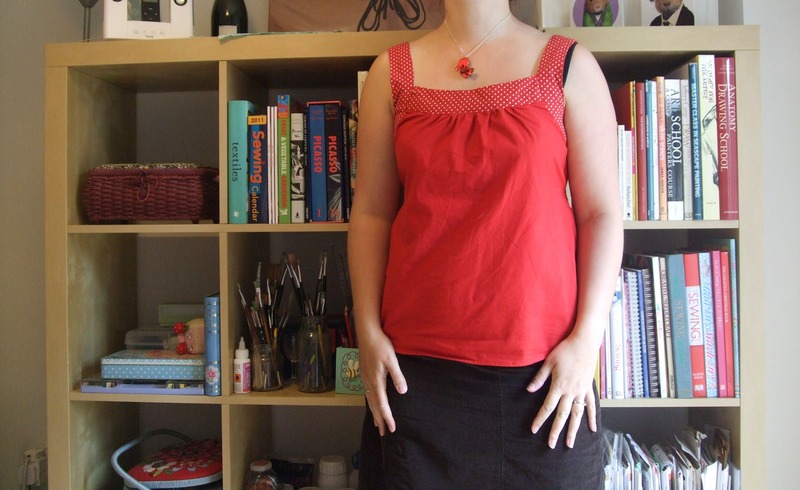 Day 30 – Sewaholic Crescent skirt in red. This is my third version of this skirt but this time I made View C – fully gathered and below the knee. I used a piece of fabric from my charity shop £1 bundle – I think it was meant for curtains but it works well enough as a skirt. I’m wearing the skirt with a navy and white striped tshirt which is now headed for the charity shop as I think it looks awful in this photo! YUK! And that’s it! I enjoyed taking part in the challenge, and just for the record, as I know it’s been a subject of some debate, I didn’t find anyone else’s blogs about Me-Made-June boring: I found them inspiring and interesting! Hi Tabatha, some lovely outfits there! I especially love your Chantilly dress. And I totally hear you about the fit of the Sorbetto top – I had similar issues. Yours still looks very pretty though 🙂 and wow what a find in the charity shop – I never find fabric when I look! Pah!! You are clearly very talented. 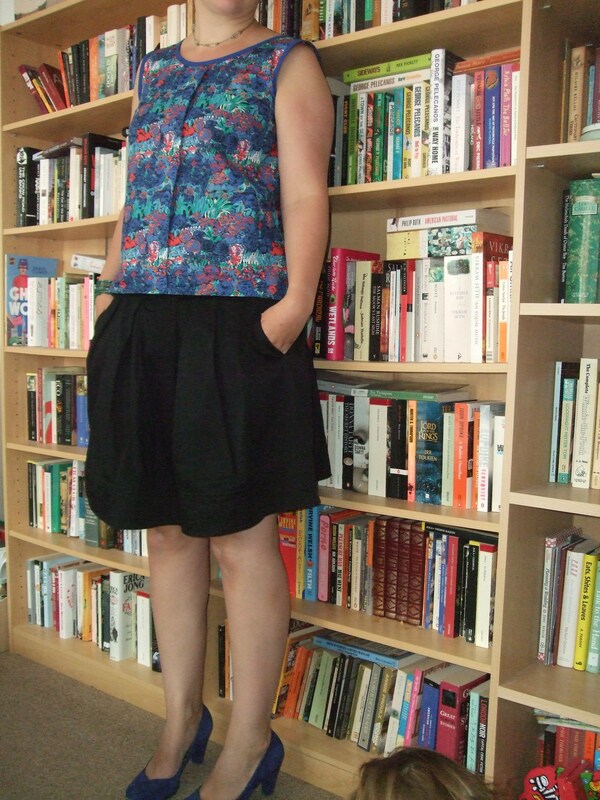 I like the print of the day 22 top, but my favourite is the skirt from day 28.